Toronto home prices have been rising since 1996 - and that has led to increased confidence in the city's housing market. To some degree real estate appreciation can be explained by the fundamentals such as income growth (between 1996 and today) and increased demand as the population grew. But as home values continued to rise something else have happened. A positive feedback loop was established. This feedback loop amplified the price growth of real estate beyond what would be warranted by the fundamentals. 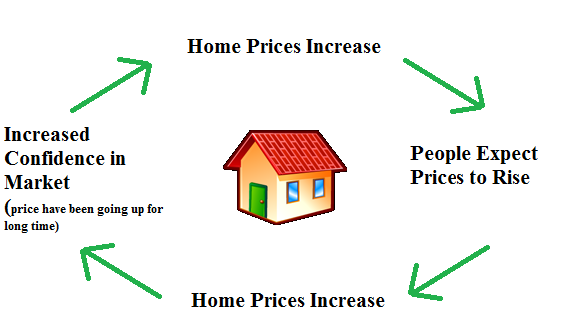 The feedback loop in the Toronto housing market works something like this. 1. Torontonians' confidence and expectations were buoyed by past home price increases. 2. So, they bid up the prices further. 3. Thus encourages others to do the same, so the cycle repeats over and over again. Past price increases generate expectations of further price increases. A good example of this would be Ryan Coyle (How to make millions in the condo market) who expects condo prices to keep on rising in the future just because they were rising for the past decade. Furthermore, because real estate prices have been going up in Toronto for the past 18 years, people got too confident in the real estate market. Increased confidence in the market fuels the bidding up of prices. The above can be summed up by the mantra of "buy now or be priced out forever". 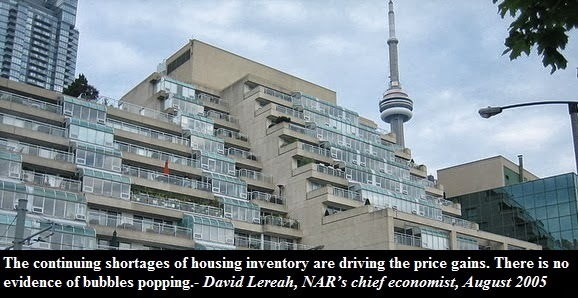 In my opinion, increasing home prices in Toronto have become nothing other than a self fulfilling prophecy as of late. Torontonians think that they have found a safe and lucrative investment - real estate. This investment can never lose and there's no real downside. The above beliefs (confidence in market and expectation of future appreciation) explain why many in this city are willing to overpay for property even though the conventional measures such as price-to-rent and price-to-income ratios suggest that housing is greatly overvalued. Finally I want to talk about the increased risk which results from such a feedback loop. As the bubble grows, it is normal for investors to generate vast profits. As an investor flips one pre-construction condo and makes a fortune, they feel more confident in their ability to make even more money. This leads to increased risk taking. 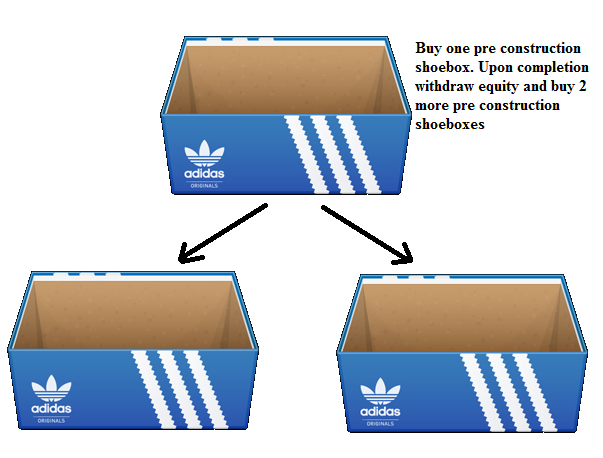 So instead of buying one pre-construction condo, the same investor now buys two or more units. A real life example of this would be Mr. Coyles's advice to take the equity (downpayment + appreciation) out of the pre-construction condo that was finished - giving you the ability to buy a few more units. Some call this strategy a 'way to make millions', while I think that this is a train wreck in the making. 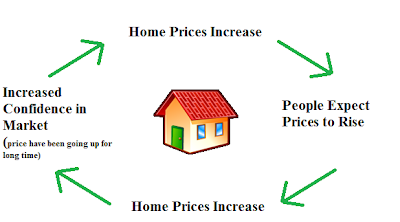 In sum, my point is the following: a big part of the real estate price growth is justified by the fundamentals but the later part was amplified by a feedback loop (confidence and expectations of future price growth) which has resulted in the housing bubble in Toronto.